This recipe is a cinch – you don’t even have to roll the pastry. I love it with peaches, but it works with nectarines too, and I’m going to try it with pears next. Meanwhile, prepare filling by mixing eggs just until whites and yolks are combined, then adding in sugar and sour cream. Mix until smooth, then stir in spices. Cut peaches into 1/2 inch or 1 cm wedges. Spoon the tart filling into the shell, and arrange peach wedges in a spiral, starting from the centre. Bake the tart on the lower oven rack at 375F/190C for 50-60 minutes, or until filling is set and pastry is golden. 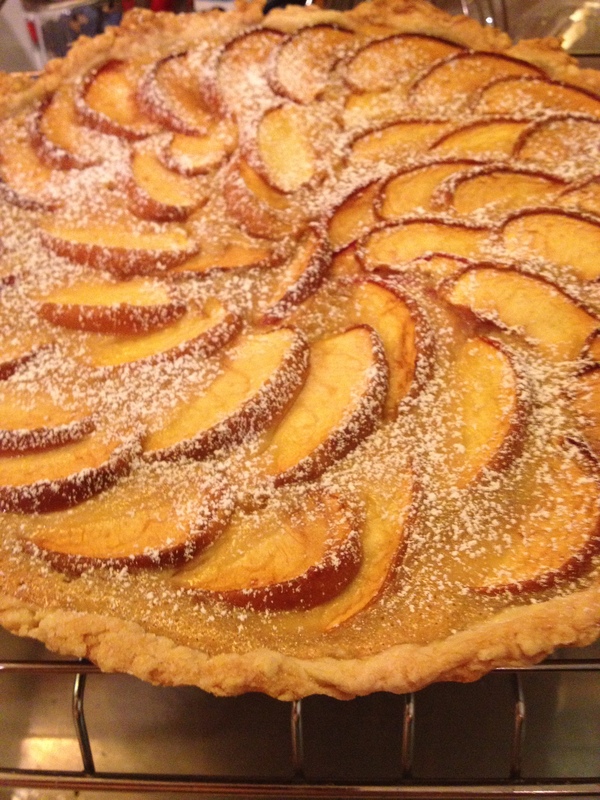 Cool tart to room temperature, then de-mold and dust with icing sugar. Serve with Earl Grey tea, or Icewine.